Looking for baby shower invitations ideas that are quick and simple to make? Well you have come to the right place! I want to show you how you can make a really quick and easy handmade baby shower invitations. These handmade invitations will be so much cuter than the ones you can buy in the store. Hopefully they will save you money as well. Regardless they will be worth every cent in the end. You can make these invitations super simple in solid colors like pink, blue, or green, and keep the whole theme super simple. Or you can go a little over the top and use decorative paper to match your baby shower theme. your aim is to save as much money using these baby shower invitations ideas as possible, then I would recommend cutting them by hand using a good sliding blade paper cutter. Otherwise, take your paper to a local copy shop to have it cut in half for you. They can cut all of your paper at once in one fell swoop, not to mention having the text copied onto it for you (and it's pretty cheap too). Once the paper is cut in half just fold these pieces in half to create cards. If your paper is cut across the middle your cards will fold from left to right. If cut the long way, they will fold from top to bottom. Using Blank Cards - Blank cards are super easy to use. All you gotta do is print the invitation wording onto the cards and decorate them. Quick and easy! Printing onto the Cards - This is not always as easy as it may seem. For one, you can easily use the printable templates I have provided in the printable section of the site. These printables will work the best if you are creating the invitations with card stock. If you are using blank cards, or find it difficult to print onto your invitation paper, you can also print onto a separate paper, cut the text out, and then glue it to the inside of the card. Decorating the Baby Shower Invitations - For the super simple baby shower invitations ideas I show on this page all you need to do is cut out some separate squares of colored or decorative paper to attach to the front of the cards. To figure out how big the decorative paper should be just measure the front of your invitations. Cut the paper to 1/2" smaller than your invitations. Again, and easy way to do this is to bring em' to be cut at a copy shop, but it is also completely do-able by hand, just takes longer. OK, this next step is completely optional. 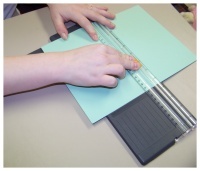 Once you have cut the paper to the correct size, next turn the paper over and use a ruler and pencil to mark a line 1/4" from the edge of the bottom of the paper. Use this line as a guideline of where to cut with your scallop edge decorative scissor. Once the paper is cut to size all you need do is attach it to the front of the invitation. Center the paper as best as you can. I think the most efficient way to attach the papers is by using a glue runner. It is super fast and there is absolutely no mess. hand and hold it straight over the invitation. Place it onto the card straight across. Press firmly in place. Now use some of the same ribbon to create a little bow. Snip any extra long ends off. Apply glue to the back of the bow and attach it to the middle of the piece of ribbon already attached to the invitation. Now trim the edges that hang over the sides of the invitation using some small scissors or an Xacto knife. These baby shower invitations ideas really can be used to make just about any kind of invitation to match any style or theme. Choose a simple solid color to match any certain color scheme. Have a specific baby shower theme? Use these bay shower invitations ideas as a springboard to create a custom invitations to match your theme. One really easy way to do this is to find a decorative paper to match your theme, or even use some baby shower gift wrapping paper. You could even go one step forward with these baby shower invitations ideas and use paper punches to decorate them. 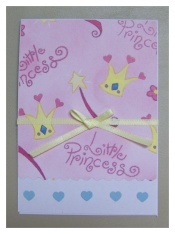 Like the princess baby shower invitations shown in the pictures above. I placed little paper punch hearts below the decorative paper to give it just that one extra little embellishment. * To make this go by as smoothly as possible I recommend getting everything ready ahead of time (your papers, text to print onto the paper, decorative papers, etc...) and bring it all to the copy shop to have it cut and copied for you. This really will make things so much easier and is a lot cheaper than you think. Don't forget that you will be saving money by not using up your printer ink as well. Printer ink is much more expensive than copies. 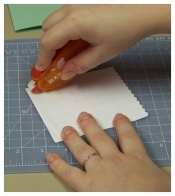 * Using a glue runner instead of glue stick or craft glue saves a ton of time. Plus there is no mess to deal with. No glue on your hands. Just make sure and buy refills. Use the glue sparingly as well to save money. They work so well that really all you need to use is a bit on all four corners, a little on the edges, and a dab to the middle. Make sure you buy the permanent kind too. * Have a little invitation making get together. Grab a couple of the guests, open a bottle of wine or make some quick cocktails, and assign everyone a job. One person can cut the paper, the next can do the folding, the next attach the paper, and so on and so on. You'll get the baby shower invitations done in no time!